All the golf you could want right in the palm of your hand. Ever since PGA Tour Golf on the Genesis, I have been a fan of golf videogames, which meant I was first in line to check out the PS Vita's Hot Shot Golf last night after Sony's press conference. I've had time to play another few holes today and have been even more impressed with what Sony's offering. Featuring 50 hours of gameplay and loads of characters and courses, the Vita version of Hot Shots is actually one of the new system's better offerings. Yes, I like Uncharted and yes, Ruin seems neat, but there's something about golf and the handheld that is a perfect fit. Hot Shots makes great use of the touch sensors on either side of the Vita. The front touch screen can be used to not only position your golfer, but you can drag your finger along the fairway to select the direction of your shot and your club. Pull the finger back to your lie and you'll club down. Push it towards the hole and you'll club up. When on the tee or the green, you can even swipe across the face of the Vita to clear leaves and other obstructions out of your way. The rear touch screen can be used to change the camera angle. Using these touch elements to manipulate the golfer feels very natural. You can also rotate the unit around to see what's around your golfer. While this is more visually interesting than strictly useful, you can get a good sense of the wind and overall lie by shifting the unit from side to side. 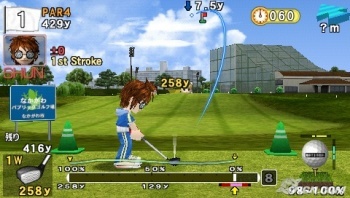 What I really like though, is the chance to twist the Vita into a portrait orientation to see more of my golfer's form during the swing. Strangely, the actual golf swing doesn't seem to use the touch capabilities at all. You're still restricted to the same two- or three-click system we've been playing with for the last twenty years. Click to start the backswing, click to stop it, and click again on contact to get the most power. You can jiggle the Vita around during contact to get a little more drive behind the ball, but it's tricky to time it just right. The only real downside to it is that the developer doesn't currently have any plans to allow for multiplayer on the same system. It seems like a real missed opportunity to me to have players swap the system back and forth for match play. On the plus side, the Wifi and 3G options mean you can play with friends almost anywhere. Throw in leaderboards, and there's more than enough here to keep virtual golfers happy until the inevitable DLC hits the market.